Welcome to the REUK.co.uk Renewable Energy Shop. Here you will find a selection of useful and hard to find items relating to DIY alternative energy generation and energy saving. Click on the name of a product to add it to your shopping basket. You will be able to set the quantity you require when you are there. A selection of electronic controllers and accessories for solar water heating systems. Handmade in UK from highest quality components. A selection of low voltage disconnects for protecting batteries from being overly discharged by automatically disconnecting the loads on the battery when the battery voltage is low. Handmade in UK from highest quality components. A selection of voltage regulators designed to supply a stable regulated output voltage for connection to voltage sensitive devices. Handmade in UK from highest quality components. A selection of user programmable low voltage timers. Handmade in UK from highest quality components. 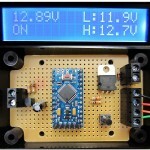 A selection of useful electronic circuits described in REUK.co.uk articles. Handmade in UK from highest quality components. Save energy (and money) in the home and office.